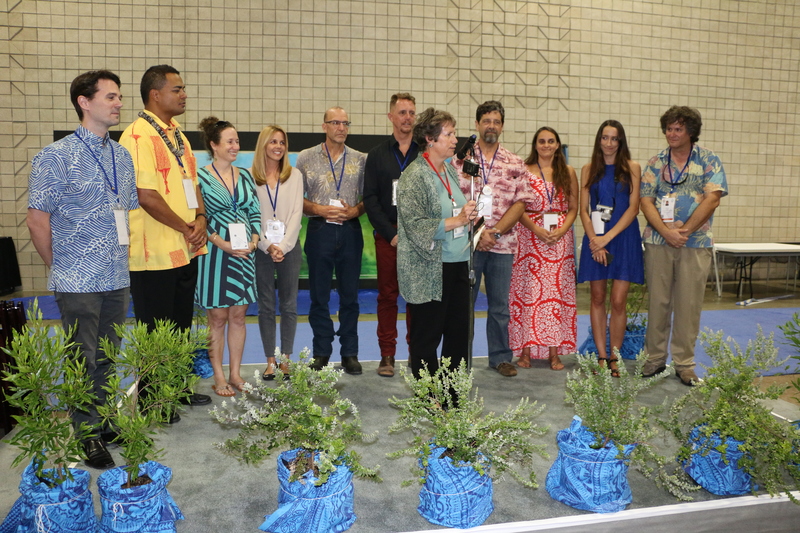 DLNR director Suzanne Case congratulates her team, including Leah Laramee (third from right). She was a key member of the Department of Land and Natural Resources’ “Outstanding Team of the Year,” nominated for their coordination of last year’s landmark IUCN World Conservation Congress in Hawai‘i. The event brought global and local environmental groups together for a record-breaking series of events that drew 10,000 participants from 192 countries. Also, through careful budget oversight, DLNR reported nearly $3 million was saved from funds appropriated and returned to the state’s general fund. Laramee, who is also the 2017 Alumnus of the Year from Kupu, a leading youth conservation organization, said DLNR is moving forward on the governor’s Sustainable Hawai‘i initiative, to protect the islands from invasive species and the threats of climate change. “We in Hawai‘i should be proud that we’re among the leaders on these environmental issues,” she said.